Roughly ninety miles southeast of Private George W. Pearsall and the Fifty-fifth North Carolina Troops, another North Carolina soldier arrived in Southeast Virginia with his regiment as a part of Confederate forces to blunt new Union advance up the James River toward Richmond, Virginia. That soldier was Private Eli Peal of the Seventeenth North Carolina Troops of Brigadier General James Green Martin’s brigade. Peal’s journey began in late April 1864, when his regiment (and brigade) was ordered to occupy the recently captured town of Plymouth, North Carolina. Confederate Brigadier General Robert Frederick Hoke led a military operation to capture the Union garrison in the town, and to gain control of the Roanoke River where it enters the Albemarle Sound. General Hoke’s assault proved to be successful due to the assistance provided by the Confederate ironclad, C.S.S. Albemarle. As a result of the battle, the Confederate forces were able to capture a large number of Union prisoners including their commander, Brigadier General Henry Walton Wessells. In his letter dated May 1, Peal talks about conditions in the recently captured town, including the smell of dead bodies still lingering in the air. He tells his wife, Luvester, of fortifying the town against a possible Union attack and the movement of a portion of his regiment over to Edenton, NC. In addition, he also mentioned the movement of the C.S.S. Albemarle into the Albemarle Sound against the U.S. Navy vessels operating there. Peal composed his letter to his wife on stationary “liberated” from the headquarters of the captured union garrison, specifically from Assistant Adjutant General, Captain Andrew Stewart. Eight days later, Peal and the rest of Martin’s brigade were ordered to leave Plymouth and return to Tarboro, NC. A greater threat now loomed over Southeastern Virginia with the arrival of the new Union Army of the James, which was now tasked to advance up the James River and take Richmond, Va. as the Union Army of the Potomac moved into the Wilderness to engage the Confederate Army of North Virginia. By May 12, Peal’s regiment and others arrived in Petersburg, Va. to form a Confederate force to move down river to stop the federal offensive. Martin’s brigade and others were ordered to assault the Union forces in and around Ware Bottom Road near Bermuda Hundred to stop the Union advance. The Seventeenth North Carolina Troops lost six men killed and forty-one wounded in their May 20th attack on the Union forces, which proved to be successful in its goal of “bottling up” the Union Army of the James. However, Private Eli Peal was one of the men killed in the attack. 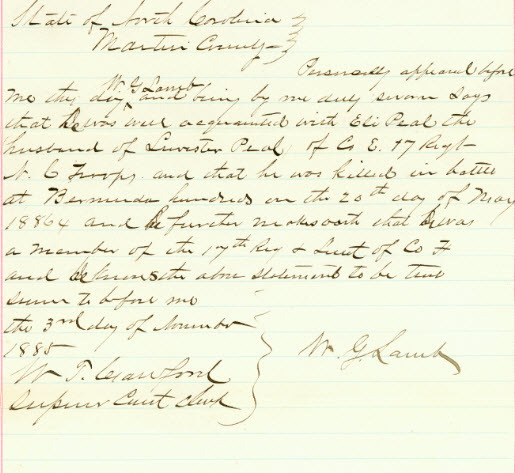 On June 7, 1885, Luvester Peal applied for a widow’s pension due to the death of her husband in May 1864. She noted that her husband had died on May 1, 1864, which was the date of his last letter to her before being sent to Petersburg, Va. with his regiment. Martin County Board of Inquiry was convened on July 24, 1885 to judge whether her claim was valid. Fortunately for Ms. Peal, William G. Lamb, a former lieutenant in Company H, testified that “…he was acquainted with Eli Peal the husband of Luvester Peal of Co. E, 17 Regt NC Troops and that he was killed in battle at Bermuda Hundred on the 20th day of May 1864…” His statement was submitted to be true, and Ms. Peal did receive her widow’s pension.